Several arrests, disrupted drug transactions, and significant seizures of heroin last week were the results of work done by single police agencies within their municipalities, and by work done by multiple local and county agencies working in concert. On April 27, 2017, an investigation conducted by the Linwood Police Department, the Brigantine Police Department, and the Atlantic County Prosecutor’s Office Gangs, Guns and Narcotics Unit, assisted by the Egg Harbor Township and Margate City Police Departments, resulted in the execution of a search warrant of one man’s Linwood home, the search of a vehicle in which he and another man were located in front of the house, the arrests of both men, and the seizure of over 2000 bags of heroin, prescription drugs, drug paraphernalia and over $1,700.00 in cash. Arrested after fleeing from police in the motor vehicle—the pursuit ending on Zion Road, Northfield—were Richard C. Roycroft, male, 30, of the 500 block of Central Avenue, Linwood, and Frank D. Gulli, male, 37, of South Essex Avenue, Margate. Roycroft was charged with distribution of heroin, distribution of heroin with 500 feet of public land, possession of heroin, 2 counts of unlawful possession of prescription drugs, and conspiracy to distribute heroin. Gulli was charged with distribution of heroin, distribution of heroin with 500 feet of public land, possession of heroin, and with aggravated assault against police officers, and two counts of eluding police, first in a vehicle, then on foot. Roycroft was served summons complaints, and released. Gulli was charged on a warrant, and lodged in the Atlantic County Justice Facility. 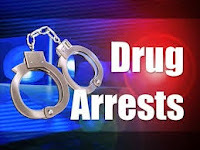 Further investigation by the Linwood City Police Department culminated in a second search warrant executed at Roycroft’s home four days later on May 1, 2017, and the seizure of another 2000 bags of heroin and approximately $1,400.00. Roycroft was charged on a complaint-warrant with heroin distribution and possession, and lodged in the Atlantic County Justice Facility. Tuesday, May 9, 2017, Richard Roycroft pled guilty to the accusation. Pursuant to a negotiated plea agreement, Roycroft will serve a sentence of 8 years in New Jersey State prison, and be ineligible for parole until he has served 4 years of the sentence. Roycroft is scheduled to be sentenced by Atlantic County Superior Court Judge Patricia Wild on June 16, 2017. These investigations are aided by municipal police departments’ mutual sharing of resources, and by support provided by detectives of the Atlantic County Prosecutor’s Office, this sharing of resources available to all police departments, but of particular value to smaller departments. Some drug distribution investigations succeed because of the help of the public. On May 2, 2017, responding to a 9-1-1 call from a concerned citizen reporting that a man was distributing heroin, officers of the Atlantic City Police Department responded to the rear of the AtlantiCare Healthplex on the 1400 block of Atlantic Avenue, and arrested Dana Gibbs, male, 52, of the 5300 block of Harding Highway, Mays Landing, seized 92 bags of heroin from him, and charged Gibbs with heroin possession, possession with intent to distribute, and possession with intent distribute within 500 feet of a public zone. Police issued Gibbs a summons-complaint, and released him pending court. The concentrated, long-term effort of a specialized unit in one police agency expedites the identification and arrests of those who would sell controlled dangerous substances. On May 3, 2017, officers of the Atlantic City Police Department Special Investigations Section conducting a narcotic investigation arrested three Atlantic City residents and seized over 6,300 bags of heroin. After monitoring a drug transaction at South Carolina Avenue and Bacharach Boulevard, police arrested Quran Stokelin, male, 23, of the 500 block of West Michigan Avenue, Atlantic City, in possession of 1 bag of heroin. Police located Darryl Tyler, male, 49, of the 1500 block of Magellan Avenue, Atlantic City, on North Carolina and Atlantic Avenues and, after a brief attempt by Tyler to elude capture, police arrested him in possession of 34 bags of heroin, and arrested Clarice Dallas, female, 33, of 400 block of St. John Street, Plainfield, NJ, for possession of marijuana. Further investigation led Special Investigations Section detectives to search Tyler’s residence, where they seized 6,325 bags of heroin, more than 1 ounce of raw heroin that had not yet been packaged for sale, and more than $8,000 in cash believed to be the proceeds of heroin sales. Tyler was charged with possession of heroin, possession with intent to distribute, possession within 500 feet of a public zone, and resisting arrest. Police lodged Tyler in the Atlantic County Justice Facility. Stokelin and Dallas were charged with possession of heroin, and possession of marijuana, respectively, and released on summons-complaints pending court. The street value of the approximately 10,500 bags of heroin removed from the streets of Atlantic County by the singular and concerted police enforcement actions in Atlantic County of the Atlantic City Police Department, Brigantine Police Department, Linwood Police Department, Atlantic County Prosecutor’s Office, the Egg Harbor Township Police Department, and the Margate City Police Department is approximately $63,000.00. Including the 4 suspected drug-related deaths last week, there have been 25 in Atlantic County in 2017 to date. This number is approximate; pending toxicology results may increase the number. The epidemic of opiate-related deaths is being addressed with a refocus of resources. Prosecutor Tyner has directed that all drug-related deaths will be treated as homicides, assigned to and investigated by the Major Crimes Unit and, where appropriate, prosecuted under New Jersey’s Strict Liability for Drug-Induced Death charge. The investigation in-progress of last week’s drug-related deaths has resulted in multiple arrests for drug distribution. The names of the defendants are currently being withheld from the public. Despite law enforcement’s mission to identify and prosecute those who illegally distribute drugs, Prosecutor Tyner reminds citizens that fear of prosecution should not keep a person from calling 9-1-1 if someone believes s/he or someone else may be suffering from an overdose. New Jersey’s Overdose Prevention Act ensures that any person who seeks help for him/herself or others who are experiencing an overdose is immune from arrest, charges, prosecution, or conviction “for obtaining, possessing, using, being under the influence of, or failing to make lawful disposition of” drugs. The central purpose of this alert is to save lives. Anyone with information that may help the Atlantic County Prosecutor’s Office and other Atlantic County agencies locate sources of illegal drugs and possibly prevent overdose incidents are asked to contact us at (609) 909-7666, or your local police department. Congratulations to all the police departments for being on top of this terrible drug problem! Anyone who sells drugs to the people who overdose and do not survive should go to prison for life! Families should get more involved with their children to monitor their activities! God bless the investigators.! I AGREE! There are to many death from this drug, keep up the good job of keeping it off the streets!